Do you cr ave beautiful, strong hair? Hair and skin are great markers of overall health. Vibrant hair depends on a balanced diet. Healthy hair depends on the body’s ability to construct a proper hair shaft, as well as the health of the skin and follicles. Eating healthy daily and good nutrition assures the best environment for building strong, lustrous hair. But note that other factors like smoking, hormonal imbalances, and not enough sleep can also affect how your hair looks and feels. Live a healthy lifestyle today. Eat a balanced, varied, protein-rich diet that focuses on the following foods and vitamins listed below, and you will be giving your hair love it deserves. Omega-3s are found in cell membranes in the skin of your scalp, and in the natural oils that keep your scalp and hair hydrated. If you do not prefer salmon, you can also get essential fatty acids from fish like herring, sardines, trout, and mackerel, as well as other non-fish foods like avocado, pumpkin seeds, and walnuts. Biotin is a B vitamin essential for hair growth and overall scalp health. Because our bodies make their own biotin in the intestines, and it is plentiful in many common foods, deficiency is very rare. You don’t need to take supplements of biotin. Eat a balanced diet that includes some high biotin foods. The mineral zinc is involved in tissue growth and repair, including hair growth. It also helps keep the oil glands around your hair follicles working properly. Low levels of zinc can cause hair loss, slow growth, and dandruff. The amount you get from eating foods rich in zinc is plenty to keep your hair beautiful. Beta carotene in foods is converted to vitamin A in the body, and vitamin A is necessary for all cell growth, including hair cells. A deficiency can lead to dry, dull, lifeless hair, and dry skin, which can flake off into dandruff. Vitamin C helps the body use non-heme iron — the type found in vegetables — to assure that there is enough iron in red blood cells to carry oxygen to hair follicles. Vitamin C is also used to form collagen, a structural fiber that helps our bodies. Hair follicles, blood vessels, and skin all require collagen to stay healthy for optimal growth. Too little C in your diet can lead to hair breakage. Because hair is nearly all protein, foods rich in protein are giving you the building blocks for hair. Protein is necessary for all cell growth, including hair cells. 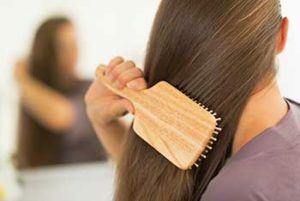 Hair gets its structure keratin, and without enough protein for keratin, your strands will weaken and grow more slowly. Second, the iron found in meat (called heme iron) is more easily absorbed by the body than the iron in plant foods (non-heme iron). These vitamins are involved in the creation of red blood cells, which carry oxygen and nutrients to all body cells, including those of the scalp, follicles, and growing hair. Without enough B vitamins, these cells can starve, causing shedding, slow growth, or weak hair that is prone to breaking. Some food examples include beans and lentils, barley and brown rice, fish, dairy products, eggs, and green vegetables like broccoli and spinach.